Ambtítol was conceived as an interactive documentary because we understand that the issue we are dealing with requires the users’ active role and participation. The aim is to set up an environment for all those former university students who’d wish to join this collective project – wherever they are. As such, Ambtítol tries to establish an open debate on the role that university plays in our societies. And to do so we need a lively open format, like the webdoc. Ambtítol proposes active navigation in which users have to build their documentary, choosing different testimonials of experiences of life around university. The users have to choose several times between two or three characters, presented with an animated image and a question the directly addresses them. With their choices they go on a personal journey corresponding to three time periods associated with university experience: the decision to study at university, the study period itself, and post-university working life. The idea of providing the opportunity to view the journey via a map is to give access to other characters. Thus, once the user has reached the final space, he can start the journey anew and learn about alternative experiences from a different character’s perspective. 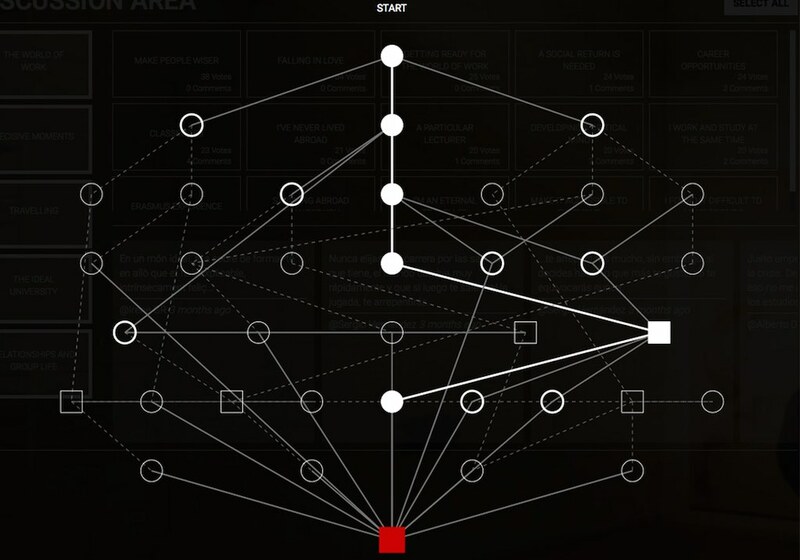 The relational structure and the short duration of the testimonial clips (one to two minutes) aim to encourage the user to generate multiple paths of between three and six characters each. During navigation, there are times when the user comes to a participative space where he must select the concept that best defines for him five relevant questions posed by the webdoc about university experience: Decisive moments, The world of work, The ideal university, Relationships and group life, Travelling. The choice of these concepts is cumulative and generates a ranking of the concepts and issues that are most relevant to the viewers of the webdoc. 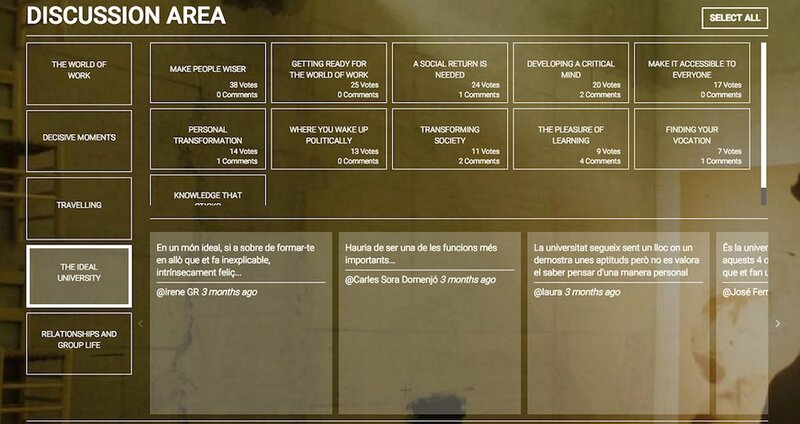 This ranking can be seen at the end of the journey in the “Discussion area” where you one see which concepts are most voted by all users and where you can also leave a written comment. Concerning the issue of what the “ideal university” looks like, for example, right now the most voted concept is “Make people wiser”. From all these unique experiences – the ones we portray and the ones the users themselves contribute – we intend to generate a debate around the future of the university. In this collective reflection we want to come to light problems or shortcomings that the public university is currently facing, so that ideas as to how the situation could be improved may emerge. Thus, the role of Ambtítol is to describe the role university plays in our lives, from a very personal and unique angle, but also, underlying, it is a desire to improve present reality. During the coming months, Ambtítol aims to stimulate discussion by presenting the project in Barcelona and other cities, delivering talks and parallel activities at other universities, foundations and secondary schools. The aim of these activities is not only to expand potential audiences, but above all, to use the webdoc as a strategy to encourage public debate on the situation of the university today. Neus Ballús (Mollet del Vallès, 1980) is a film director and scriptwriter. Her first feature-length film, La plaga (The Plague,2013) was screened at the 63rd Berlinale (Berlin International Film Festival) and has won four Gaudí Awards 2013. She has also been nominatded for the 2013 LUX Prize and the European Film Awards besides receiving one nomination for the Goya Prize. 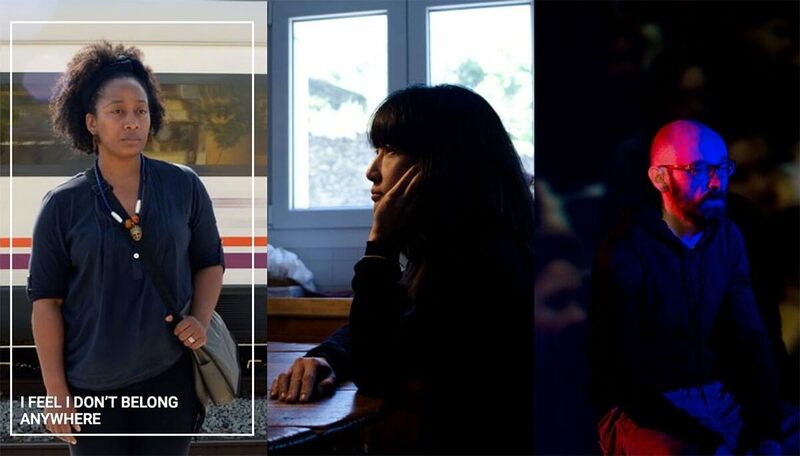 Tracing the relationships among five local characters, the film portrays everyday life in Gallecs, in a rural zone of the Vallès Oriental region on the periphery of Barcelona. With a degree in Audiovisual Communication and a Master’s in Documentary Making from the Pompeu Fabra University, she has also made the shorts La Gabi (2004), L’avi de la càmera (Grandad with Camera, 2005) and the documentary Immersió (2009), the latter work being filmed underwater in a public swimming pool. This film was awarded the Best Short Film Prize at the ALCINE Festival. Her next film will be shot in Senegal, dealing with the western tourism experience. Carles Sora (Barcelona, 1980) is an interactive designer, media artist and lecturer of digital media at the Audiovisual Studies Department of Pompeu Fabra University, where teaches in graduate and postgraduate courses. He holds a PhD in Social Communication with a research on digital temporalities from UPF (2015), an Interdisciplinary Master in Cognitive Systems and Interactive Media from UPF (2009) and a B.S. in Multimedia from UPC (2004). He has directed and participated in several interactive projects in contexts such as visual arts, theatre and museography. He was founder member of the interactive exhibition studio Touche.cat (2009) and director of the Digital Technologies for the Stage programme (2010). He is advocate of digital temporalities, interactive documentaries for social change and other creative technologies forms. He has presented his work in several academic and artistic international venues, among them in Recto/Verso as artist in residence at Méduse (Quebec) and in Muestra Internacional de Performance (México DF).